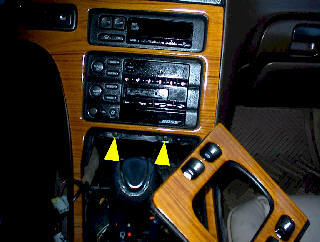 However, you may upgrade this stereo to a '93-97 stereo with CD and cassette. With the '95-97 stereo you will need an adaptor for the difference in their connectors. This adaptor can be found on our website bottom of page at Infiniti. 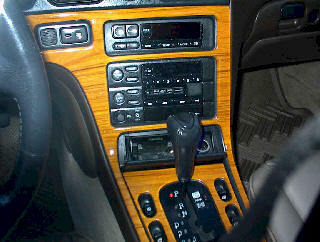 1) Lift panel around gear shift from the back. The front of the panel has two hooks that go under the ashtray. Be careful not to break them off. 2) Remove four screws exposed from removing panel. 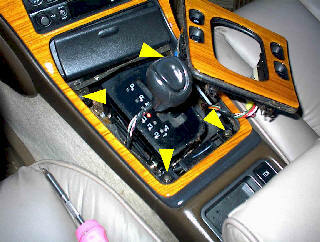 Two located behind the gear shift to each side and two holding a metal bracket under the ashtray, remove metal bracket. 2) Remove two screws exposed by removing ashtray. 1) Pull panel forward releasing clips, be careful around the area where the panel goes behind the steering column. 2) Disconnect all wires to panel. 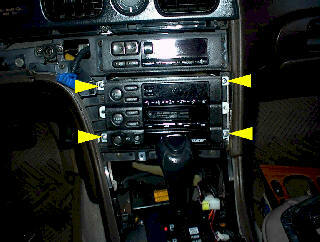 3) Remove four screws securing Bose car stereo to dash. 4) Pull Bose car stereo forward to allow access to all connectors and disconnect.